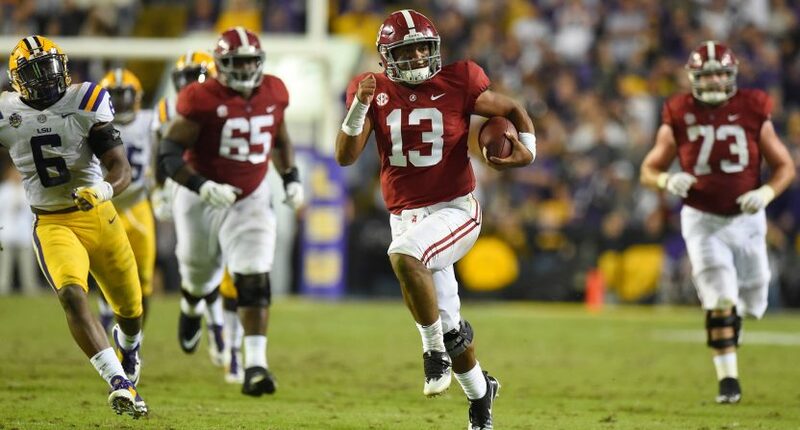 At the very beginning of the season, the college football media anointed Alabama quarterback Tua Tagovailoa as the Heisman Trophy favorite. Actually, it was before the season started. Since engineering the comeback in last year’s National Championship Game, Tua has been this year’s Heisman front-runner. So often nowadays, with a 24-hour college football media, the narrative rules over the actual results. Players don’t start off with close to an even chance at the Heisman. There are always preseason favorites, and being on Alabama never hurts. Coming into this season, not only was Tagovailoa the Heisman favorite, he was the only proven main candidate. Kyler Murray and Dwayne Haskins had potential, while Will Grier’s name was sometimes mentioned, but none of those players had Heisman-type seasons coming in. Then again, neither did Tagovailoa, but his one game last year made everyone forget that fact. As the season progressed, Tagovailoa did nothing to lose his front-runner status. He put up great numbers on a dominant team, while other candidates didn’t have the stats or the narrative to keep up. Haskins played one (relatively) poor game against Purdue, and his team’s result seemingly knocked him out of the running. The same, for a long time, applied to Kyler Murray as well. Trevor Lawrence didn’t put up the numbers to be a contender, and players like Travis Etienne, Ian Book, and Grier (to name just a few) never built the necessary narrative. The Heisman certainly seemed to be in Tagovailoa’s hands. Of course, that might have changed this past Saturday. Tagovailoa struggled against Georgia before being pulled after suffering an ankle injury. In a reverse of last year’s National Championship Game, Jalen Hurts came in to revitalize Alabama’s offense and pull out the win. Maybe that result, coupled with Kyler Murray leading Oklahoma to victory over Texas, will lose the trophy for Tagovailoa. Of course, he will still get a trip to New York City to be a finalist. Of course, this misses the basic point of the Heisman Trophy. Yes, it’s supposed to go to the best player in college football. That often translates to “the best player on the best team,” though sometimes not. That is certainly the form of attention that Tagovailoa gets. Unfortunately, even by this standard, he isn’t Heisman-worthy. Usually, a Heisman contender has a litany of great plays. From a dual-threat quarterback, they usually come in the form of long runs, or scrambles followed by a good throw. Those plays also, almost always, come at pivotal moments of big games. From pocket passers, we usually see a great throw under pressure – or the occasional scramble, made all the more impressive by a lack of movement. When running backs win, it’s usually with otherworldly stats and a few big plays. Tua Tagovailoa, though, has none of that. He’s a very good passer, certainly, but he hasn’t been forced to prove it. He is playing with the best wide receiver corps in college football. Alabama’s offensive line has provided him with as much time as he could ever ask for, consistently, in just about every game this year (the only real possible exceptions are against Mississippi State and Georgia). The strength of Alabama’s defense means that Tagovailoa never had to prove himself under pressure. And, the one time that the Tide really did face pressure, Jalen Hurts had to come in to save the game. Watch any of Tagovailoa’s highlight videos on YouTube. The large majority of his best plays are just accurate throws to open receivers. He certainly does that well, but being an accurate passer doesn’t make him the best player in college football. The truth is, we have no idea how good Tagovailoa is because we’ve never had to see him do anything on his own. His offensive line and receiving group makes his job really easy. Tua Tagovailoa very well could be the best player in college football. He hasn’t proven it, though, because he hasn’t had to prove it. We have no idea how good he really is when not facing inferior competition (relative to his team’s talent). And that’s just not something that should win a Heisman Trophy.